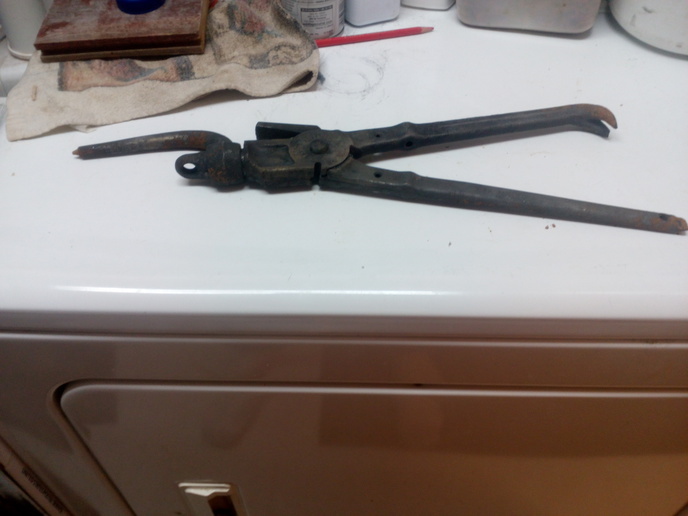 Can someone please identify this tool? I'm pretty sure it's a clothes dryer. (quoted from post at 20:20:52 02/06/1 I'm pretty sure it's a clothes dryer. Strieby & Foote fencing tool. Made by Coulter Tool Co. The small loop on the front is for an S hook. Hard to find one with the S hook still with the tool. I am sure jeffcat will be along shortly to disagree with my answer to to your question..
(quoted from post at 03:51:44 02/07/1 Can someone please identify this tool? No won't sell. It was among my grandpa's things and will be going on the wall. Now that I know what it is. (quoted from post at 07:02:53 02/07/1 Thanks everyone. Hang onto it like you said.. I have saw a few of them sell for $75 - $100 and one sold at an estate auction in WV for $150. Jump over to Ebay. Looks like the same thing. Item # 132480888122. No, it's a red pencil. how does that thing on the front work?????? ?